Tributes have been paid to a talented teenage footballer who collapsed and died of a suspected cardiac arrest mid-way through an under-15s match. Ben Walker, 15, fell on the pitch as his side Thrapston Town Juniors FC were playing on Friday. The sports-mad teen, who was also an avid cricketer, was rushed to hospital but passed away later that day. Ben's club, which is based in Kettering, Northamptonshire, has since paid tribute to the schoolboy. Flowers and football shirts have been left outside the club's home ground, Chancery Lane in tribute to the youngster. The ground remained open on Sunday to allow fans to pay their tributes. A statement on Thrapston Town FC's website said: "It is with great sadness we learnt that young Ben Walker passed away Friday night whilst doing the thing he loved, playing football for the U15s in a league game. "It is with a heavy heart we send our condolences to Nicola, Andy and Sam on the very very sad news. Our thoughts and prayers are with them at this time. "Also we send our condolences to Rusty, Ben's team mates and all at Thrapston Town Juniors Football Club." The Aston Villa fan's sudden collapse during the match against Ise Lodge U15 Hawks is believed to have been caused by a cardiac arrest. Family friend Aaron Clipston tweeted: "On the 28th of April Benjamin Walker had a cardiac arrest whilst playing the game he loved and sadly lost his life. "He was a long loyal fan of Aston Vlla, where he loved watching his team play on a beautiful stage at Villa Park! "He was a real gentleman and a pleasure to be around. "He had such a bright future ahead of him and was also looking forward to becoming a season ticket holder watching his team play next year." Tributes on social media with the tag #BatsOutForBen began being shared in memory of Ben. 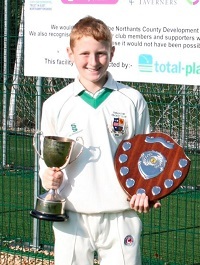 Thrapston Cricket Club, where Ben was a wicket keeper and batsman, said in a statement: "As well as a talented footballer, he also represented Thrapston Cricket Club as a promising wicket keeper & batsman. "Thoughts of everyone linked to Thrapston Town football & cricket club are with the Walker family at this sad time. "All of the home cricket fixtures due to be played this weekend have been postponed and a minute's silence will be held at all Weetabix Youth League games as a mark of respect." Other youth football and cricket teams have expressed their shock and sadness at his death. Corby Kingswood Juniors FC said in a statement: "Our thoughts and condolences go out to the family, friends and teammates of Ben Walker, who sadly passed away whilst playing football for Thrapston Town U15s last night. "Our thoughts also go out to those who were at the game last night including the referee, crowd and players." A statement from Wellingborough Old Grammarians Cricket Club, said: "On behalf of Old Grammarians Cricket club we express our deep sadness at the sudden death of Ben Walker, aged 15, during a game of football for Thrapston Town Football Club Juniors. "Our thoughts and prayers are with Ben's family and friends at this extremely sad time."